Cowboy Mounted Shooting is a sport that combines barrel-racing, gymkhana, cavalry drills, and target shooting. The overall goal is to get the fastest time, shooting as many targets as possible, with no mistakes -- which is a lot easier said than done! The course consists of 10 targets (colored balloons) set up in a variety of patterns. These patterns are designed to test both horse and rider to their limits. Competitors wear Old West costumes, ride in old Western-style saddles and tack, and engage the targets with two .45-caliber single-action revolvers, loaded with 5 rounds of special blank ammunition. (So you see, there's no room for error!) Our contestants may take on any persona from the Old West, fact or fiction -- cowboys, lawmen, gunslingers, saloon girls, cavalrymen, mountain men, American Indians, outlaws, and many more. Most competitors use replica Colt .45 Single Action Army revolvers, the famed "six-shooter" of Western legend. 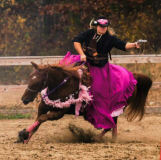 The New Hampshire Cowboy Mounted Shooters are the Granite State's outpost of this fast-growing sport. We were the first CMSA club in all of New England. First organized in Feb. 2004, we now have more than 50 members, with more joining every year. 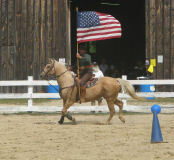 We cooperate with the Northeast Six Shooters in Massachusetts, the Maine Cowboy Mounted Shooters, and the Connecticut Renegades, to put on Mounted Shooting events all over New England. See our Calendar for a list of upcoming events, the FAQ page for more information about the sport, or the Contact page to get in touch with someone who would love to talk about the sport! All NHCMS events are held under the rules of the Cowboy Mounted Shooting Association. Safety is ALL-IMPORTANT at our events, including both riding safety and firearms safety. Practices will be held Thursday nights from 5pm to dusk at the Hillsborough County Youth Center Foundation Grounds. All members: Please send in your favorite horse pictures so they can be posted to the website. Email to Shad. This website and all content is © 2013 to the NH Cowboy Mounted Shooters, unless otherwise noted.